We’ll Get You the Compensation You Deserve! If you or a loved one was suffered a burn injury, our legal team is ready to aggressively fight any insurance company that tries to minimize a payout for your pain, suffering and other damages. Our team of compassionate and empathetic attorneys are here for you, to help ease your burden during this difficult time. What Are Common Causes of Burn Injury Accidents? Depending on the severity of injuries – multiple surgeries and long-term medical care and therapy may be necessary for a full and healthy recovery. At Lerner and Rowe, we have a proven track record of getting you the financial compensation you deserve to help ease your burdens. We provide excellent client care, and the integrity of our attorneys fighting for your case is unparalleled – we won’t cut corners, and we won’t quit. The damages that a burn victim faces are not only physical, but psychological as well. Being burned to such a traumatizing degree takes an extreme toll on the victim’s self-esteem and can potentially cause depression. The compensation you may receive could cover therapy and psychological care to help the victim as well as the victim’s family. Burns vary by degrees – a first degree burn is the most common, and affects only the epidermis (the outer layer of skin). It’s similar to a sunburn, without the blisters, and healing usually occurs in 3-5 days. A second degree burn is often pink or red, painful, and may appear wet. It affects the entire epidermis and upper layers of the dermis (second layers of skin). It will usually heal in 10 – 21 days. 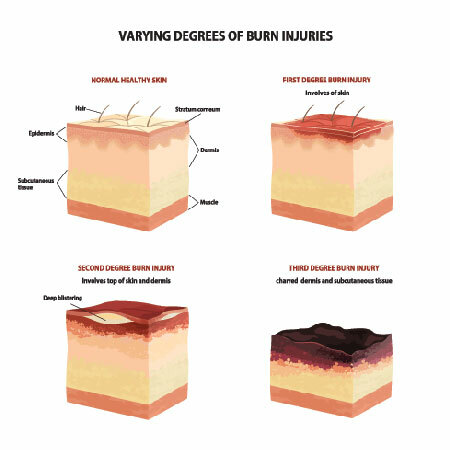 Third degree burns involve all layers of skin, and damage affects the subcutaneous tissues. The affected area may look black or white, and will be dry, leathery, and can be very painful. However, nerve endings can be affected as well, and may reduce or eliminate pain all together. Our aggressive attorneys are ready to fight and will go after those responsible for your injuries. They will help build a case that will hold responsible parties liable for medical expenses, lost-wages, damages as well as pain and suffering. Call us at 844-977-1900, or submit a free online case review form. Your initial consultation is FREE and you don’t pay unless we win your case!